To run your WooCommerce site effectively it is necessary to find out right plugins. There are thousands of WooCommerce Plugins available in online. Among these we choose the best plugin that unique, user friendly and low cost or free. Does your WooCommerce Products meet your needs? Would you like to add conditional logic in your form? Do you want pricing options to capture your shopper attention? 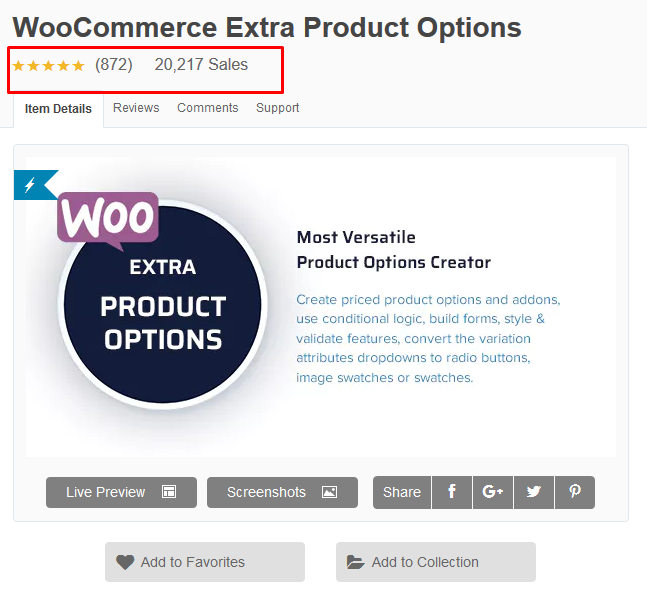 WooCommerce Extra product options plugin is the best WordPress plugin that you looking for. This plugin helps you to create product price options and addons, build forms, conditional logic, image swatches, features style and validation and so on. this awesome plugin helps you to add header, logo, footer, custom paragraph texts, body text, social icon, drag and drop interface. 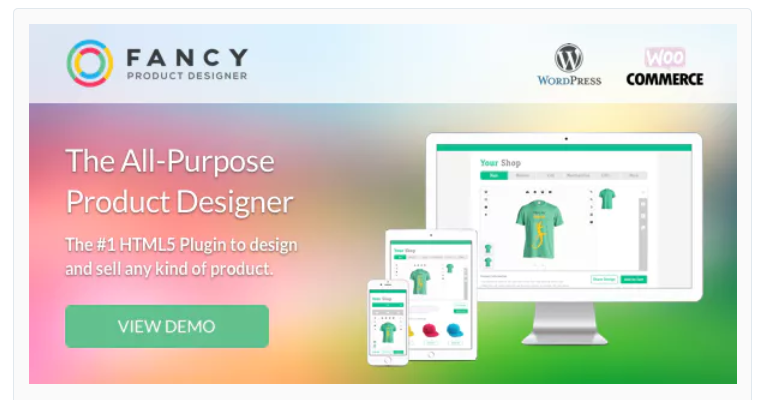 Your Woocommerce online store gets beautiful transactional emails by this plugins. You can design your email that catches the attention of your target audience. You can customize you email from some predefine template just changing the logo, header, footer and so on. This plugin help to create your own shipping rate on the basis of condition. You get ultimate flexibility and you don’t need anything to start. By using conditions you can create your own table rate shipping. Like – you can use Volume, Weight, State, Country to rate your shipping. This plugin offers you multiple shipping methods and without any programming language knowledge you can set your shipping rate specifically. This flexible plugin is offered several options for front-end display and update exchange rating options. The exchange rate is automatically updated. This plugin send a notification email whenever the exchange rate is necessary. This plugin is also manually set the exchange rate. It allows you to set permanent exchange fees to exchange rates. You can offer your customers to customize any type of products no limitation. They decided which product they need to customize. It offers individual products views to interactive upload zones and bounding boxes for customization. It fit for any product by developing features, functions and user interface. This plugin also offers color picker tools to choose any color that they like. This plugin help you to show your products in a table view. It’s a easy short code generator that perfect for restaurant orders, product catalogs and order forms. 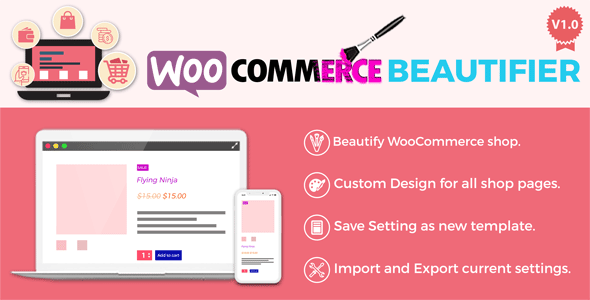 WooCommerce Beautifier is the plugin that offer you several options to customize your design. You can customize the shop page content, cart page content and so on. You change your content color, font size, style, padding and so on by this plugin. WooCommerce is an easiest free e-commerce that helps to sell your product via online. WooCommerce is an open-source e-commerce plugin. This plugin designed for small-to-large size merchants who maintain their business via online WordPress sites. It’s free WordPress plugin that has additional features available as extension. You can manage your inventory and shipping and take secure payments by this plugin. You get 100% control of your data. E-Commerce is the most popular plugins. And across all websites WooCommerce is the solution that powering 42% for all line store. This Plugin is completely free for everyone. Anyone can use it and modify it. Today, it’s become very popular because of its simplicity and user friendly customization. Plugin Author: Mike Jolley, Jamers Koster. A number of high traffic websites used WooCommerce like – Small Press Expo. Among the e-commerce sites 30% run by WooCommerce. And millions of active installs in 2015. In 2018, WooCommerce become most popular plugin. Because it has 39 million downloads and currently active on more than three million websites. You can get everything about e-Commerce by this plugin. For any store e-commerce is ideal. 1135 WooCommerce themes are available on ThemeForest. 548 WooCommerce themes are store on WordPress.org theme directory. 240 WooCommerce themes are available on Mojo Themes. You can sell anything like – physical and digital goods in any shape or size. You can add unlimited images and products in your online store. You can get free shipping, real-time calculations. You can also limit to specific countries shipments. You can also get the opportunities to accept payment with cash on delivery, paypal, bank transfer or major credit cards. You can get complete control of your sites. Just one click to refunds, gust checkout and customer accounts. You can customize store location with language, currency and measurement units. You can define your sites style with Storefornt that are the free WordPress theme available at WooCommerce. 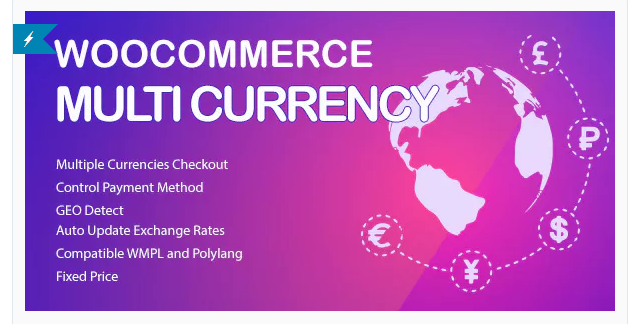 Today, WooCommerce become popular e-commerce platform on internet.Because, It’s easy to make an E-Commerce site by using WooCommerce plugin. However, customization of WooCommerce shop is not easy. Therefore, WooCommerce Beautifier plugin gives you opportunities to customize your WooCommerce Shop within few minutes. You can change your “Shop page” content, “Minicart” content, “Cart” page content. Like product title, price, add to cart button, sale badge, page title and so on. This amazing tool offers you to change color, font style, and many more options to customize your online shop pages. Customize your Shop/ Mini Cart/Cart/Checkout /Shop/Single Product/Category/Tag pages. Customize all pages content by using Global Setting. Beautify page content by changing BG color, Font color, padding, font size, font style and so on. Reset you current setting for all tabs. Reset the current settings of selected tab only. Import / Export the settings. Save as new template feature. Save change as template and apply saved template in future. 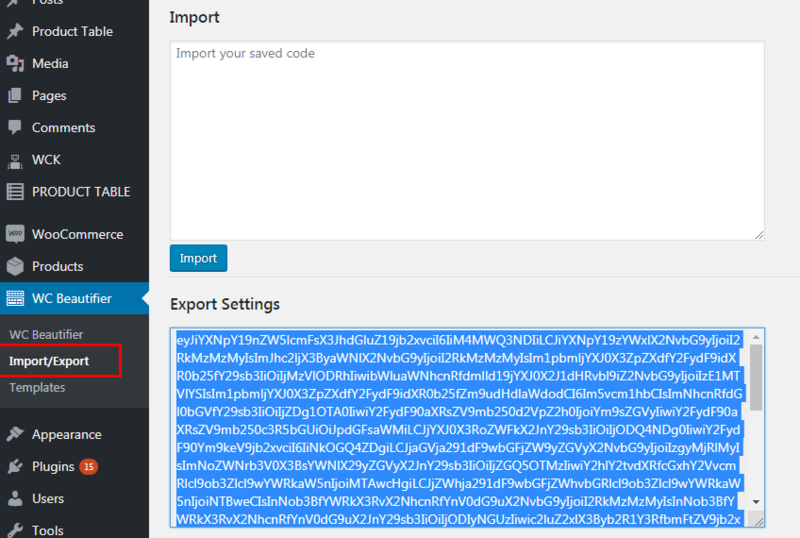 Step 1: After downloading the zip file from the Codecanyon you will get a full zip file of Codecanyon. When you will extract that zip file you will get another zip file “WooCommerce_Beautifier_V1.0_02.25.2019.zip”. Step 2: Go to your website’s dashboard > Plugins > Installed Plugins . Step 3: In the top of the page you will find “Add New” button. After click on “Add New” button you will get “Upload Plugin” button. Step 4: Click on Upload plugin and browse the file “WooCommerce_Beautifier_V1.0_02.25.2019.zip’. That file you will get before from Codecayon.zip folder. Make sure that WooCommerce Beautifier plugin file is in .zip format. Upload that and click on “Install Now” button. 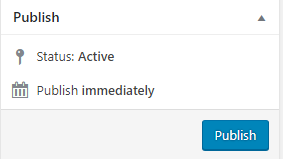 After Installation you need to active plugin by click on “Active Plugin” button. Well Done!!! You successfully install your WooCommerce Beautifier Plugin!!! After successfully installation you will get a WooCommerce Beautifier plugin menu in your dashboard. Like – Dashboard>WC Beautifier. Click on that and you will get the magical settings!!! General – Customize your rating color, in stock color, in stock Font weight, in Stock Font Style, Out of Stock Color, out of Stock Font weight, Out of Stock Font style for all pages. Sale badge – Customize your sales badge text color, BG color, border color, border radius, Font Weight, Font style, Font size, padding for all pages. Price –Customize your product price color, font weight, font style for all pages. 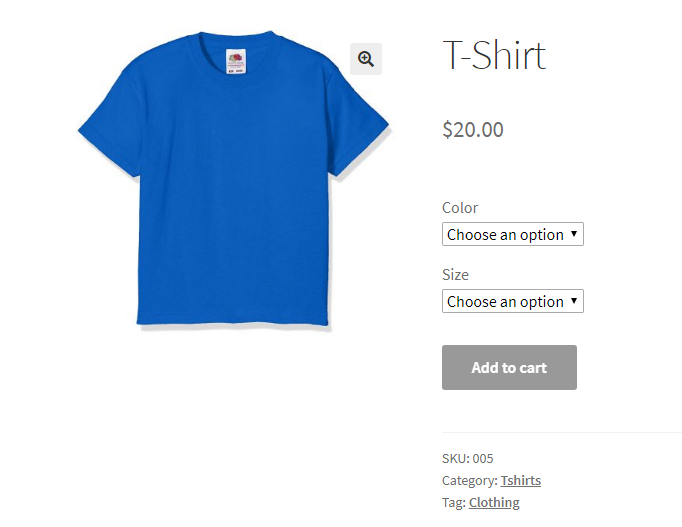 Add to cart button – Customize your Add to cart button color, BG color, font size and so on for all pages. Add to cart button hover –Customize your add to curt button hover color, BG color, Font Weight, Font style, Font size and padding of your WooCommerce site’s all pages. Success message box –Customize your success message box’s text color, link color, BG color. Warning message box – Customize your warning message box’s text color, link color, BG color. Basic – Customize your Mini Cart’s remove button color, product name color, product name hover color from this. View Cart button – Customize your view cart button color, BG color, Font Weight, Font Style, Font Size, padding from this option. View Cart button hover – Customize your View Cart button hover color, BG color, Font Weight, Font style, Font size, padding from this. Checkout button – Customize your checkout button color, BG color, Font Weight, Font style, ,Font size, padding from this. Checkout button hover – Customize your checkout button hover color, BG color, Font weight, Font style, Font size, padding from this. Basic – Customize you remove button color, remove button cross color from this. Page title – Customize you page title color, BG color, Font weight, font style, font size and padding by this option. Checkout button – Customize your checkout button color, BG color, Font weight, Font style, Font size and padding by this option. Checkout button hover – Customize your checkout button hover color, BG color, Font Weight, Font style, Font size, padding by this option. Cart Table Head – Customize your cart table head color, BG color, Font Weight, Font Style, Font Size, padding by this option. Cart table body – Customize your cart table body color, link color, BG color, Font Weight, Font style, font size and padding by this option. Page title – You can customize your checkout page title color, BG color, Font weight, Font style, Font size, padding by this option. Coupon section – You can customize your checkout page coupon box BG color, coupon box padding, apply button color, apply button BG color, Apply button Font Weight, Apply button Font Style, Apply button Font size Apply button padding by this option. Payment method section – If you want to make your payment method section more attractive you can customize your selected icon color, BG color, label color by this option. Place order button – you can customize your place order button by changing text color, Button BG, Font Weight, Font style, Font size, padding by this option. Place order button hover – you can customize your place order button hover color, BG color, Font Weight, Font Style, Font size and padding by this option. Page title – If you want to customize shop page title color, BG color, Font Weight, Font style, Font Size, Padding you can use this option. Product name – If you want to customize your shop page product name color, hover color, font weight, font style, font size, padding you can change the setting from there. Price – If you want to customize your shop price color, Weight, Font style, Font Size, Padding you can use this option. Add to cart button – If you want to customize your shop page’s add to cart button color, BG color, Font Weight, Font style, Font Size, Padding you can use this option. Add to cart button hover – If you want to customize your shop page’s add to cart button hover.You can customize it by changing color, BG color, Font Weight, Font style, Font Size, Padding by this option. Product name –Customize your single product page product name color, hover color, font weight, font style, font size, padding by this option. Price – Customize your single product page price color, Font Weight, Font style, Font Size, Padding by this option. Add to cart button –Customize your single product page’s add to cart button color, BG color, Font Weight, Font style, Font Size, Padding by this option. Add to cart button hover –Customize your single product page’s add to cart button hover color, BG color, Font Weight, Font style, Font Size, Padding by this option. Page title – You can change your category page title color, BG color, Font Weight, Font style, Font Size, Padding by this option. Product name – You can change your category page product name color, hover color, font weight, font style, font size, padding by this option. Price – You can change your category page price color, Font Weight, Font style, Font Size, Padding by this option. Add to Cart button – You can change your category page add to curt button color, BG color, Font Weight, Font style, Font Size, Padding by this option. Add to Cart button hover – You can change your category page add to cart button hover color, BG color, Font Weight, Font style, Font Size, Padding by this option. Page title – You can customize your tag page title by changing color, BG color, Font Weight, Font Style, Font Size, Padding by this option. Product name – You can customize your tag page product name by changing color, hover color, Font Weight, Font Style, Font Size, Padding by this option. Price – You can customize your tag page price by changing color, Font Weight, Font Style, Font Size, Padding by this option. Add to Cart Button -You can customize your tag page add to cart button by changing color, BG color, Font Weight, Font Style, Font Size, Padding by this option. Add to cart button hover -You can customize your tag page add to cart button hover by changing color, BG color, Font Weight, Font Style, Font Size, Padding by this option. You can save your customize style as a template easily. Give a setting name and click on “save as Template” button. If you want to apply from your saved template, click on WC Beautifier> Templates. Click on “Apply This Style” from your saved template. And it will apply in your WooCommerce site. Simple!! You can import your current style for all pages easily. Go to WC Beautifier> Import/Export. Here, you see the some code inside the export field. Copy the code and save it in your computer to use later. When you need to import the style you just paste it into the import field. And click on import. That’s it. After installing WordPress successfully you need to first understand how to install plugins because it allows you to add more features in your WordPress. Today I wanna show you how to install WordPress Plugins. For this you need to follow some easy steps. Lets start ….. Step 2: You will get a “Search Box” in the right side of the page. Search by the Plugins name. Here, I search “WooCommerce Plugin”. Step 3: Here, you will get an “Install now” button in the right side of the Plugin. Click on install now button. Step 4: After Installing you will get an “Active” button. Click on “Active” Button. That’s it. You are successfully installing a plugin in your WordPress sites. Thank you. E-commerce (Electronic Commerce) becomes popular today. Many people who are even not thought about doing business, are now trying to involve into e-commerce. E-commerce is the easy, smart process that actually attracts the people. E-commerce is buying and selling products on the online platform or using internet. You can use your personal computer, laptop even mobile for operating your daily business work. In e-commerce you need not mandatory office room or employees. You can handle all the transactions by setting your home. Today, e-commerce creates a wide market place and anyone like – small businessman, freelancers or even though large corporation knocking the door of e-commerce. Therefore, in global economy e-commerce is now fastest growing industries and every year it grows 23%. B2B (Business to Consumer) – In business to business transactions companies doing business with business. In this process the final consumer is not involve. It’s only involving manufacturers, wholesalers, and retailers and so on. B2C (Business to Consumer) – In the process of business to consumer the company directly sell their products to the consumers by using their personal websites or using internet. Like – Amazon, Jabong, Flipkart and so on. C2C (Consumer to Consumer) – In this process the consumer directly contract with other consumers. It helps general people to buy and sell their personal products like – OLX, Quikr, Bikroy.com and many like this. Scope of business is huge. People can reach a wider market place as well as remove the geographical barrier. Transactional cost would be lower. In addition, people can possible get higher margin. Quick response to customer can possible that can saves your times, money and energy. Serve customers 24 hours. That actually helps to engage with the customers all the time. Are you looking for a easier way to control WooCommerce Min Max Quantity & Step for Single Products? Yes, I’m going to tell you about how to control WooCommerce Cart quantity for single products. Why WooCommerce Min Max Quantity & Step Control Single? In your WooCommerce store there may some products that customer needs to purchase in bigger quantity. For instance, if you have a Wholesale store customer may purchase 50 pieces of shirt. Then how he increase the number of cart quantity to 50? Yes, we all know in WooCommerce we increase the quantity in cart one by one. That’s take much time. 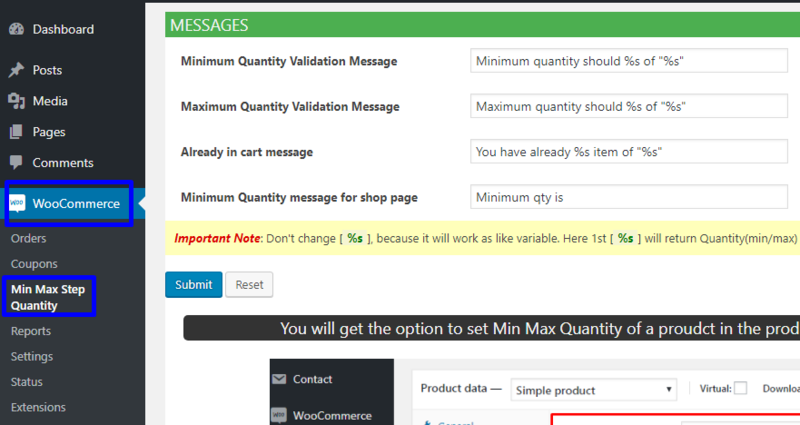 But you can control the step in cart using WooCommerce Min Max Quantity & Step Control Single plugin. It’s totally free in WordPress plugin archives. Also you can set the minimum purchase quantity and maximum purchase quantity with this free plugin. If you want to control WooCommerce Min Max Quantity & Step for global products read this article. First of all, install WooCommerce Min Max Quantity & Step Control Single. For this, go to WordPress Dashboard of your site. Then navigate to Dashboard->Plugins->Add New and type the plgugin name in the search field. From couple of plugins install the right one. After installation activate the newly installed plugin. Note: You can also read how to install and manage a WordPress plugin. Now, go the the single product page which you want to configure. You can navigate to Dashboard->Products->All Products and edit the products you want. From Product Data click on Min Max & Step and configure the cart quantity. Min Quantity: From Min Quantity input box give the Minimum number of products customer can purchase for this product. Quantity Step: In Quantity step input field input the increment and decrements step for this single product. After configuration publish the products and view the product. See how does it works below gif file. So, this is all for today. I hope you have understand how to control WooCommerce Min Max Quantity & Step for single products. If you face any problem leave a comment below. Using Product Catalog to show WooCommerce product is the best way to increase sale of a Ecommerce store. But the problem a beginner face is to select the right plugin. Almost all of the plugins to create product catalog is premium. And hence they don’t have the opportunity to check whether the plugin works fine with their site environment. To overcome this problem I’d like to suggest you using a free WooCommerce Product Catalog plugin. Is there a free WooCommerce Product Catalog plugin? Great news for you that there is awesome plugin to make Product Catalog for your WooCommerce product. The plugin is Woo Product Table which is free on WordPress Plugin Archives. Using this plugin you can make your product catalog. Perfect for Wholesale Store, Order Form, Restaurant Menu Order Form, Online library etc. Let’s see how to make a Product catalog with Woo Product Table. 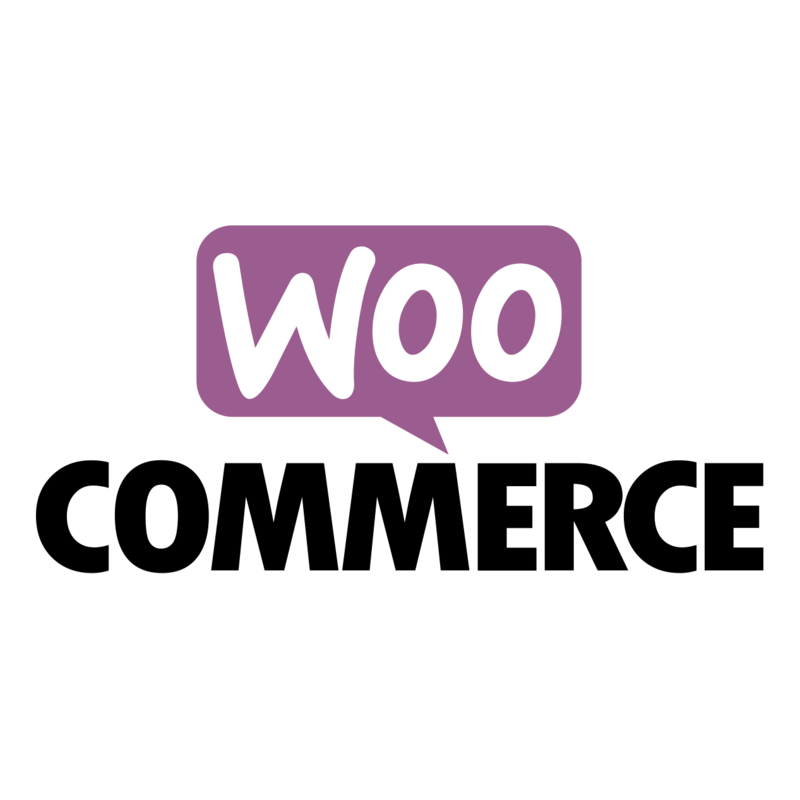 First of all download Woo Product Table plugin. You Can download the plugin from here. Note: Woo Product Table is a WooCommerce add on. 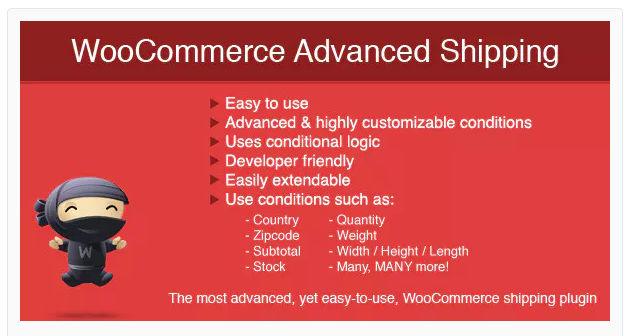 So before installing Woo Product Table make sure you have installed WooCommerce on your site. Also you can directly install Woo Product Table from you Dashboard. To install directly from Dashboard head over to Dashboard-> Plugins-> Add New and from the right side search for Woo Product Table. The plugin is user friendly and anyone can use the plugin without any coding idea. It mainly uses a shortcode generator to customize the Table. From the Column Tab select the column you want to include in your Product Catalog. To customize table navigate to Dashboard-> WPT SHOP-> WPT SHOP-> Column. Here you can change the tables column order by drag and drop option (see screenshot). From Basics Tab you can select which category of products you’ll display in product catalog/table. To display a Category of products in the table simply select the Category from the box named Category Include. Similarly you are able to select the Tag which will be shown in table. From Conditions Tab you can select the Shorting Order of products as well as select the Order By. Set the Maximum Price of product to display in the product catalog from Set Maximum Price box. Also you can set the description length of a product from Set Description Length box. You may set how many products will be displayed in table. To do that input the value in box named Post Limit/Per Load Limit. Woo Product Table is mobile Responsive set as Default. However you can change it from Mobile Responsive box. 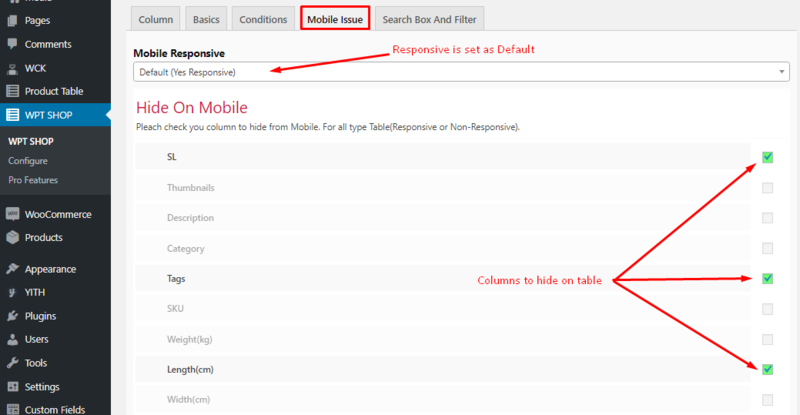 Besides, you can hide as many as column as you want on mobile device. 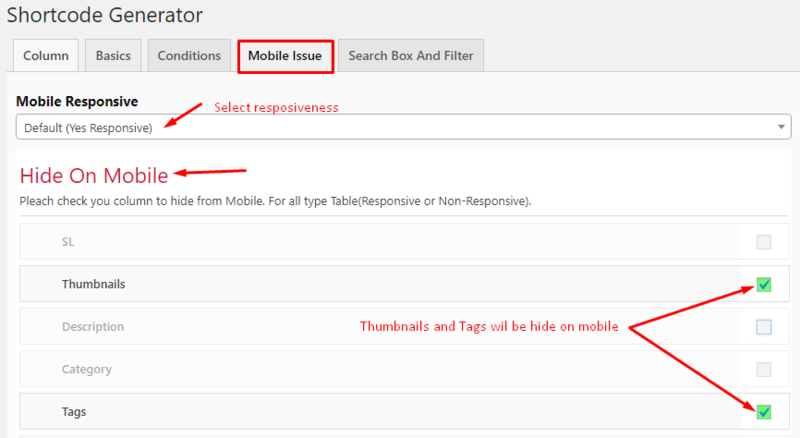 To hide a column on product catalog/table just tick the checkbox from Hide On Mobile Section on Mobile Issue Tab. Only pro user are able to use this tab. From here you can add Instant Search, Advanced Search as well as add a Filter above your product table. After all is set up click on the button Generate Shortcode(Recommended). You will find this button at the bottom of all the five tabs I’ve discussed above. After generating shortcode copy it by right click from the the shorcode generator text-box. Now paste the shortcode to a new/existing Page/Post. You can see the premium version of this plugin in my previous post. However reading this article you can make a WooCommerce Product Catalog in free of cost using Woo Product Table. If you have any question beyond this article please let me know in comment section. If you run a WooCommerce store then you’ll definitely want to increase your sales rate. To reach the goal WooCommerce site owner perform some tricks. Among them using a Product Table Plugin is always considered a good decision. There’re few plugins to show your products in a table view. But almost all of them are premium version and have the chances to conflict between your remaining Theme/Plugins installed on WordPress. So how would it be if there is a null version of premium to display products as product table? Today I’ll introduce a plugin WooCommerce Product Table Free version. What is WooCommerce Product Table? 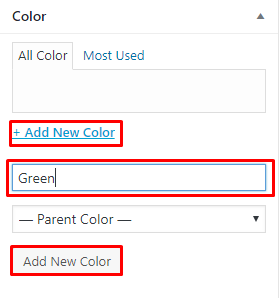 In WooCommerce plugin there are some feature given as default. Such as WooCommerce products are shown in Shop page. In the Shop page each product is separately and the products take much space of your device screen. From there you can purchase a products as many as you want. But the problem arises when you want to purchase multiple products at a time. For each product you have to Checkout individually. 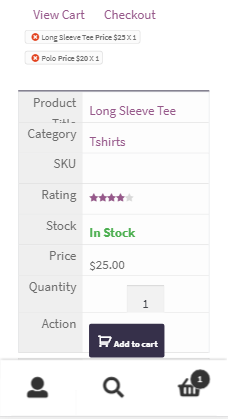 A WooCommerce Product Table actually shows your WooCommerce products in a table view. By using a Product Table you can display more products more dynamically that increases the conversion rate. WooCommerce Product Table Free is the free version plugin of Woo Product Table Pro(Bestselling WooCommerce Product Table Plugin on CodeCanyon). Though it’s a free version you can do a lots of stuff with this awesome plugin. Some notable features of this plugin are listed below. Let’s have a look some features in brief. Woo Product Table is a plugin that displays some of your WooCommerce Products/All Products in a table view. Worries for responsiveness on smaller screen? Great news for you that Woo Product Table is mobile responsive. Also you can hide some columns on mobile device. Using WooCommerce Product Table you can customize each table differently. The most important feature of this plugin is a Shortcode Generator. This plugin comes with a Shortcode Generator customizing which needs no programming idea. So if you’re a beginner or have little knowledge on programming, you’re gonna love this plugin. 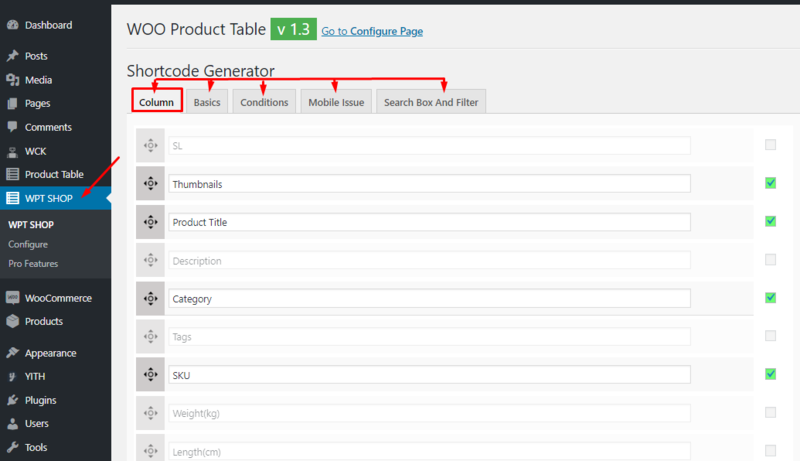 In WooCommerce Product Table plugin you need no coding. Just Tick the Checkboxes that you want to include in your table. Suppose you want to customize Table Header in your local language. Then it’s a good news that you can customize all the Table Header in Product Table. In WooCommerce when a customer purchase a product default system redirect user to the Checkout page. If a customer purchase multiple products he has to checkout each time differently. Isn’t that tedious? WooCommerce Product Table plugin will get rid you from this tedious process. When you click on Add To Cart the product is added to Cart by Ajax Action that’s need no page reload. You can add multiple products one by one and Checkout only once for all products at a time. You may have a product of different variation like color or size, then you can show all the variation in the product table. There is a Mini Cart above the table which shows the info how many products have you put in the cart and their respective price. Thumbs image LightBox is already added in this plugin. So you needn’t additional plugin to add the feature. You can select which category/Tag related product to be shown in the table. So it’s easy to organize your table to show products of specie one or more Category and Tag. You can also show multiple Category of products to show in the table. For this select the Categories you want to show in the table . If you want to display products between a price range you can do that easily. Woo Product Table Free allows user to show products below a maximum price range. 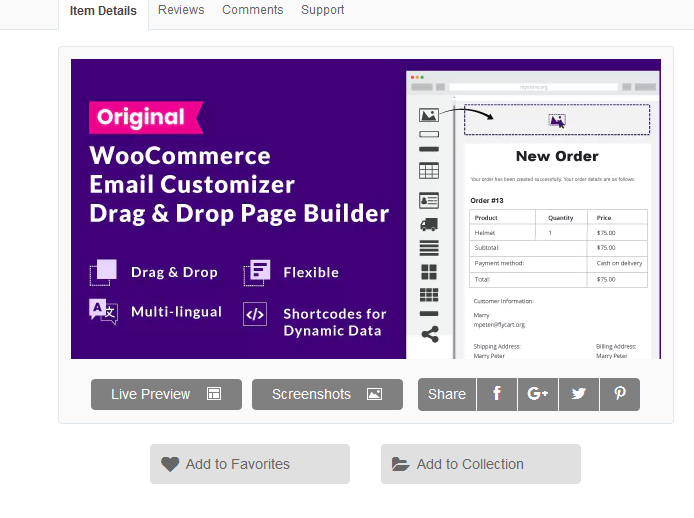 You can see the Premium version of WooCommerce Product Table Free at Woo Product Table Pro. In WooCommerce there are some most having feature to increase your conversion rate. All the thing you’ve to do is making the buying experience easy for your customer. When they feel comfort to buy and it becomes easier to find their desired products then they’ll visit your site to purchase. To make the purchasing experience great a WooCommerce store should have a Search option. There are some plugins to add the search feature in WooCommerce store. In this guide I’ll show how to add and use the search feature in woocommerce. Here in this guide I’ve used a plugin that is enabled to add the search feature. Also it shows the WooCommerce products in a table view. Lets see how to enable Search feature with Woo Product Table Pro plugin and show the products in a product table. There’re two types of search in this plugin. One is Instant Search and the other is Advanced Search. Both of the search procedure will be shown here. 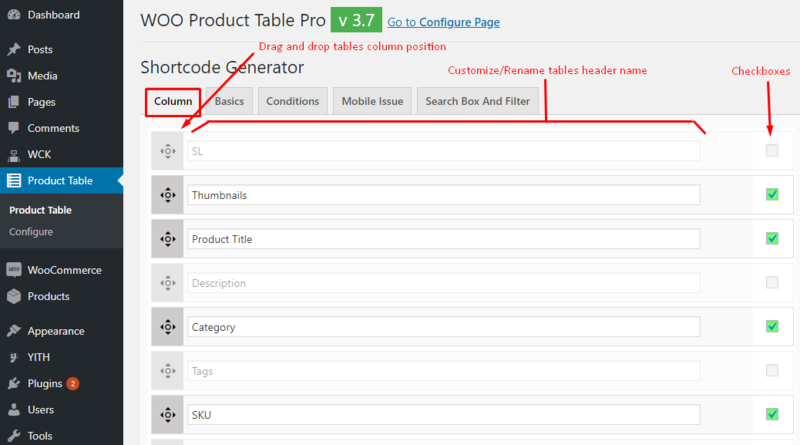 Woo Product Table Pro plugin follows the following major step to show the products in a table view. First of all install the plugin on WordPress and active it to use it. Publish and see how does it looks. Instant search in product table is used to find the products that are already loaded in the table. Suppose in the product table there have loaded 50 products. Then from those loaded products you can search any products by Product Title/Category/Tag. If the searched item belongs to the previously loaded products in the table then the searched item will show in the table, if not, the table will be blank. Navigate to Dashboard->Product Table->Configure and find Instant Search Filter option. Then select yes from the text-box. 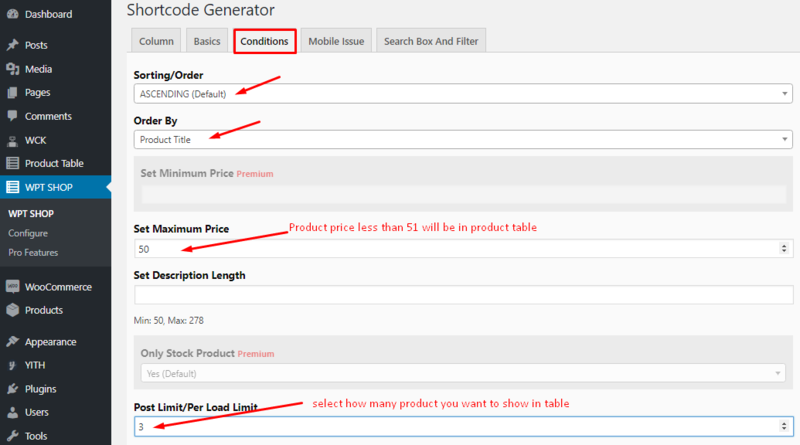 Now configure the shorcode generator to define how and which products will be shown in your table. To configure shortcode navigate to Dashboard->Product Table->Product Table. There will be five different tabs. They are listed below. How to use Custom Taxonomy in WooCommerce? After all customization generate the shortcode. Copy the shotcode from text-box and paste it to a new page/post or in an existing one. Publish the page and head over to View Page to see the results. Remember here, if the typed keyword related product doesn’t have in the table then the table will be blank after you search it. Enabling this feature any items from the store can be find out and show the related product in a product table by Product Title. Follow step 2 in Instant Search. Dashboard->Product Table->Product Table->Advanced Search And Filter and select Show Search Box (Default) from Advanced Search Box. Then generate shortcode, copy that and paste in a new page/post or in a existing one. Publish the page/post and go to View Page. Here in the search Keyword text-box type product title and click on search. The keyword related product will be shown in a product table. 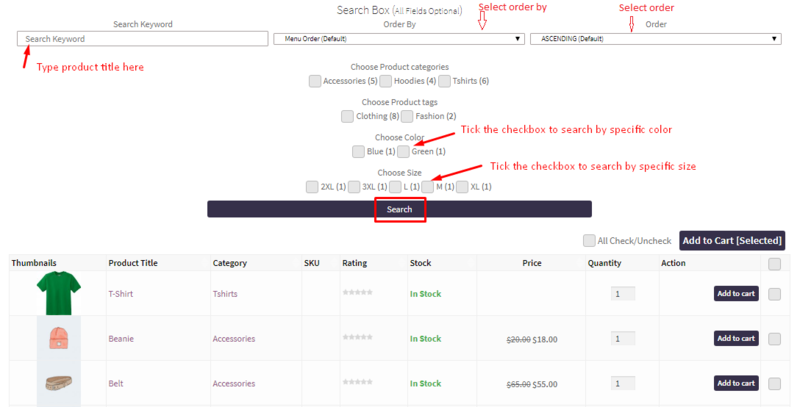 To search the product in a specific category or tag just tick the related checkbox. Though in this plugin there are Instant Search and Advanced Search given as default it also works with taxonomy search. 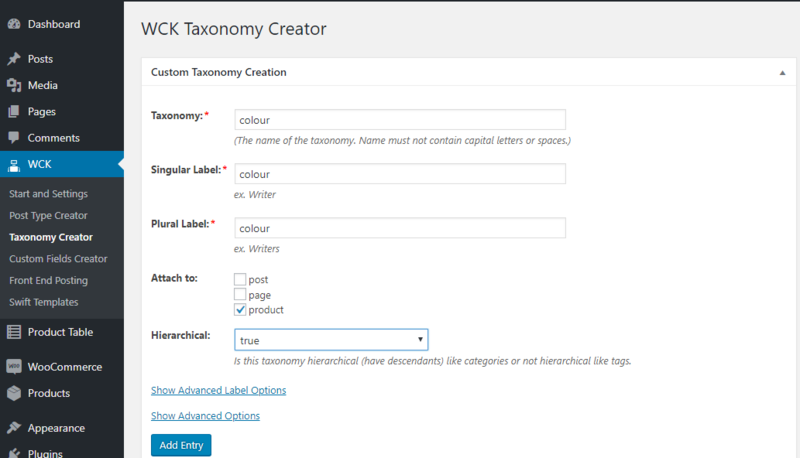 So if you have a taxonomy created by taxonomy creator plugin you can search your product in specific taxonomy. To know more about Taxonomy creating and customizing please follow, How to use Custom Taxonomy in WooCommerce? In that article there was a custom taxonomy named color. Now following that article create a new taxonomy named size and edit your product size from product page. Navigate to Dashboard->Products->All Products and edit the product you want. Navigate to Dashboard->Product Table->Product Table->Advanced Search And Filter and add product_cat,product_tag,size,color in Taxonomy Keywords for Advance Search Box. Also select Show Search Box (Default) from Advanced Search Box. Note: Use small letter in text-field. Make other necessary changes from other tabs of shortcode generator. Generate shortcode and copy that. Paste the copied shortcode in a new page/post or in an existing one. Head over to View Page and see the changes made. There any product can be searched by product category, tag, color and size. Just tick the related checkbox and click the search icon. Filer in Woo Product Table Pro is used to filter the products that have been loaded in a table. Suppose a table has been loaded in page or post you want to show the products that belongs to specific category/tag/color/size or by custom taxonomy. Then you can use this filter. To know more about the plugin follow Woo Product Table Pro. WooCommerce Custom Taxonomy is the feature to show extra product data based on a class. It may be your product color, size or may be style. What is WooCommerce Custom Taxonomy/WooCommerce Custom Field? Most WordPress beginner face conflict between Custom Taxonomy and Custom Field. So let’s clear the conflict in a brief. First of all, the both items are used to show extra product data. But there are some types of data we use for each product individually like product title, price, e-mail, maps. In that case use Custom Field. On the other hand, sometimes we need to classify a group of product like color, size, category etc. Use Custom Taxonomy to classify a group of product. So you can use WooCommerce Custom Taxonomy and WooCommerce Custom Field to show extra product information. Use Custom Taxonomy to show the info of a group of product and Custom Field to show individual info of a single product. However, this article is about using Custom Taxonomy. If you want to know more about Custom Field see How to Use Custom Fields? How to add WooCommerce Custom Taxonomy? Adding a WooCommerce Custom Taxonomy requires a plugin. There are some plugin to perform that. Among them I suggest to use Custom Post Types and Custom Fields creator – WCK as it is user friendly. Now I’ll show step by step how to add and show Custom Taxonomy in WooCommerce. First navigate to Dashboard->Plugin->Add New and in the Search Plugin text-box type WCK. There will appear some plugin. Among them install and active Custom Post Types and Custom Fields creator – WCK. Select Attach to option. Also Select product if you want to add the taxonomy for product. And finally add the entry. I want to add custom Taxonomy to my product to show the products color information. So in the picture given above I’ve added a Taxonomy named color and attached it to product. Input the Product Name in Add New Product text-box. Head over to sidebar and click on Set product image from product image section. Click on Upload Files->Select Files and select the image file for your product. After selecting the image file click on Set product image button as given in screenshot. Here the created value taxonomy was Color (in step 2). So at the sidebar there will be a section called Color. Now we’ll input the value of color for this product. 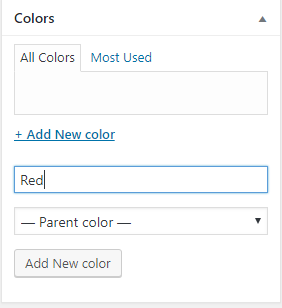 To input the color name click on +Add New Color and input the value in the text-box. Finally click on the Add New Color button. Now click on Publish button from top right sidebar. Click on View Page to see the changes done. In the table you can see a column red marked Color showing the color of different product. So isn’t it easy to make WooCommerce Custom Taxonomy and show the Custom Taxonomy in product table. Whatever I know making some easy tasks beginner falls in problem. If you face any problem please go through the comment section. In WooCommerce a product may have some variations like color, size, style or anything that you may need to specify. In that case we use product variations to show the variations in product. Now let’s see how to add product variations. From Dashboard navigate to Dashboard->Product->Add New (or Edit for an existing one) and in the text-box type the product name. Head over to Product data and from the box select Variable Product. Now head over to attributes tab and click Add. Then type the attribute name and give the value in text-field. Separate each value with “|”. Add more attributes in this way like size or style and click on Save Attributes. Now click on Variation and from Add Variation text-box select Create variations from all attributes. If you input only one attributes then select that from Add variation text-box. Finally click on Go. Now click on expand variation. Then click on upload image icon. Head over to Upload files->Select Files and here select the images for product variations. Finally click Set Variation Image. You will be given a number of variation. Set the variation images for all the individual variation. Click on Set product image and select anyone from the uploaded images for this product variation. Now from the Add Variation text-box select Set regular prices and click go. Set the value for regular price and click OK. Select the SKU for each product in ordinal number one by one. Tick the checkbox of Manage Stock and input the number of products available in Stock Quantity. Now select the category. click on +Add new category and input the name in the text-box and click Add new category. Also create the Product Tag. 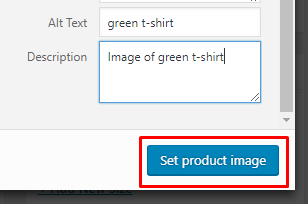 Input in the Product Tag name in the text-area and click Add. Finally publish the page. Click on View Page. Your product page may look like this. If you use Woo Product Table Pro plugin your products in the table may look like. I hope you’ve got the task adding product variation in WooCommerce. Using product table plugin you can show your WooCommerce products in a table view. You can visit to see how does Woo Product Table Pro works. What is Add to Cart multiple products? 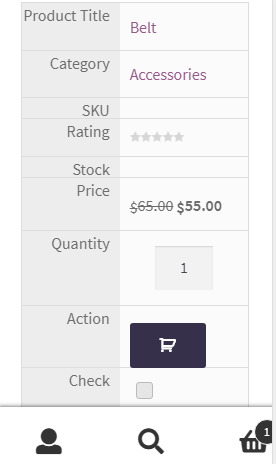 In WooCommerce when you click on add to cart the product is added to cart. In this procedure each time you’ve to go to the product page. For purchasing a single product this is ok, but if you want to bye multiple products at a time each time you click on Add To Cart and you’re redirected to checkout. Isn’t that a bit boring. Why do you need add multiple Product to Cart? If you want to increase your sells you’ve to give your customer some advantage to bye their preferred products. If someone bye multiple products at a time he may feel to checkout once for all his chosen item at a time. In that case you need to add the feature to checkout once for all the selected products at a time. When do you need Add to Cart multiple Products? To be benefited more from your WooCommerce store you need to know about the buying habits of customer. Do they purchase multiple products at a time? If yes, then you may need to give the feature to add multiple product and checkout once for all selected product. Here are couple of example when do you need the feature. If you run a bookstore then customer may buy multiple books at a time. Each time they click on Add to Cart, they are redirected to the checkout page. When a customer buy five books he’ll be redirected to the checkout page five times. Isn’t that boring? When you’ve a wholesale WooCommerce store then customer may buy multiple products. So they have to visit checkout page for each purchase. Give them offer to select multiple product and pay the bill in checkout once. If you manage a food order form or may have an restaurant , you know customer doesn’t buy single item always. Most of the time they order for multiple items. So your selling rate will be high if get the opportunity to checkout once for all the selected items. So through an option to select multiple products at a time from one page. Now I’ll show you how to add multiple products to the cart simultaneously and checkout once for all the selected products. At the right side of the table there is a checkbox to select multiple product and above the table is Add to cart button to drop the products in the cart. Like the plugin? 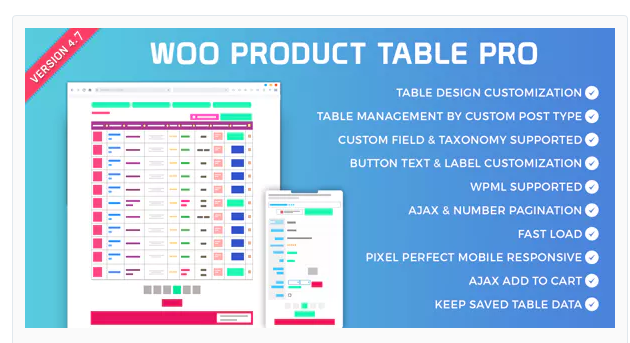 Get in details about Woo Product Table Pro. Now let’s see how to add multiple products to cart at a time. To buy multiple products tick the checkboxes and select Add to Cart above the table. In this feature when you add a product from the table’s Add to Cart it needn’t page reload for Ajax. You can add multiple product one by one through tables Add to Cart button that doesn’t redirect to checkout page, instead it will be added to a Mini-Cart.Then from the right side of the Mini-Cart you can Checkout all the selected products that you added to cart before. From product table click on Add to Cart button which you want to purchase. Select as many as you like to buy and at last click on Cart/View Cart/Checkout to checkout once for all the selected items. This is a complete guide about adding and customizing WooCommerce Filter for Product Table. What is filter in WooCommerce? 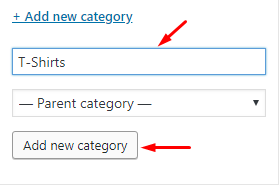 Actually filter in WooCommerce is the feature that enable a dropdown to filter your products. The procedure are performed with Ajax that needs no page reload. So filtering helps to find the desired products more specifically that saves the valuable time of your customer. As a result sells increases with conversion rate. Few days back I just need to buy a pair of shoes. So I had look into a Ecommerce site who are famous for exporting worldwide brand shoes, slippers and some other accessories. They have thousands of products in their store which assigned different categories. I wanted to purchase a pair of casual shoe of size 9 in Black. But unfortunately there was no functionality for filtering product for size. For this I’ve to switch to another site as I was then in a little hurry. Now let’s see how to add Filter in WooCommerce Product Table. Now we’ll add WooCommerce Filter for Product Table which is given default. First make a product table. To do navigate to Dashboard->Product Table->Product Table. Now customize your table by shorcode generator and generate shortcode. Copy the shortcode and paste in a new page. Let’s have a look how is the product table before using Filter. Now we’ll add a filter to the table. To add filter navigate to Dashboard->Product Table->Product Table and customize shortcode. Go to Search Box And Filter Tab and in Mini Filter box choose Filter Show(Default). Now generate shortcode and paste it to a page or post where you want to show the filter. Here I’ve taken a new page named Filter and pasted the previously copied shortcode in text area. Now publish the page and click on view page. On the top of the table there is a WooCommerce Filter for Product Table by which you can filter your products in Category and Tag. There is a good news that you can add WooCommerce Filter for Product Table by custom taxonomy. Following the five steps given below you can do that very easily. To add filter by custom taxonomy we need to install an additional plugin to create custom taxonomy. There are some plugins in wordpress to do that. I’ve used Custom Post Types and Custom Fields creator – WCK. Navigate to Dashboard->Plugins->Add New search for Custom Post Types and Custom Fields creator – WCK. Select the name of the taxonomy (must not contain capital letters or spaces), Singular Label and plural Label. Then choose Attach to Page/Post/Product. Here I’ve chosen product as I’ll show it for product. Select Hierarchical True and click on Add Entry. Now Navigate to Dashboard->Products->All Products and edit the products you want to do. At the right sidebar you’ll get the taxonomy what you have created before. Click on Add New(Taxonomy Name) and input the value. Then click on on Add New (Taxonomy Name) button. Now navigate to Dashboard->Product Table->Product Table->Search Box And Filter. In Taxonomy Keywords for Filter (Separate with comma[,]) type your taxonomy name. In the box there is color and size for taxonomy that we created in taxonomy creator and product_cat and product_tag for default taxonomy in Product Table Plugin. Remember here, each taxonomy must be separated with comma. In the given screenshot color and size are for custom taxonomy. The rest of two are for WordPress default Taxonomy Category and Tag. Generate shortcode and paste to a page/post and publish it. Go go View Page to look the change. So in table shown above you can see a WooCommerce Filter for Product Table. You can also skip step 4 if you want to use customized shortcode in the page directly. Change color and size beyond your custom taxonomy. 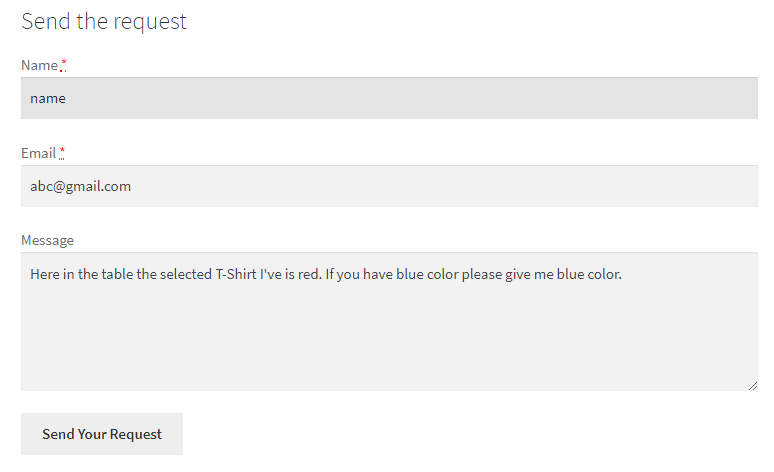 There is a great news that in WooCommerce Product Table plugin you can use Custom Fields. You can use Advanced Custom Fields with this WooCommerce Filter for Product Table to show extra product data. With the comparability of Custom Field it can be used to Filter products. Isn’t that awesome. When there are too many products in product table to find the exact desired one, customer can find by Filtering products from table. You can make a WooCommerce Filter for Product Table in easy three steps. Install and activate Advanced Custom Fields plugin from WordPress Plugins root directory. There are some customization needed to use Advance Custom Field. To know about creating and customizing Custom Field please see How to Use Custom Field in WooCommerce Product Table Pro. Note: 1. You can change the order of position of cf_brand upon your demand. 2. Before I created a custom field named brand. So here I have used brand. Try your own. Now type Brand, after Product Title in column-title’s inverted comma (“”) section as I’ve shown below. Then update the page and from the top of the page click on view page. So here an extra column has appeared than before named Brand. I hope you’ve got it customizing WooCommerce Filter for Product Table. This is a step by step tutorial on how you can add Custom Fields In WooComerce Product Table and show extra product data. The fields you use in your site such as product title, price, ratings, date are called metadata. Those fields are given as default in WooCommerce site. But, if you want to add a field say brand for your products, that field are not available on WooCommerce. To do this you need to add an extra fields by using Custom Fields creator. The uses of Custom Fields are so much to describe in a word. Let’s have look how you can use Custom Fields In WooComerce Product Table. How to add Custom Fields? Add and configure your Custom Fields following the five easy steps. In this guide we’ve used Advanced Custom Fields plugin with Woo Product Table pro plugin. To add a Custom Fields in your WooCommerce site log in your site. From Dashboard navigate to plugin. On the top-left of the screen click on add new. Then in search option type acf. You will see some plugin. Try Advanced Custom Fields among them. Install the plugin and and active it. You can active it from Dashboard->Plugins->Installed Plugins->Advanced Custom Field and then active it. From the top of the screen input your Field Group Title in Add New Field Group. Here I’ve input Brand Name. Input yourself what you want. Then click on add field right-left to the screen. After that select your Field Label from Field level option. Here I’ve given Brand as Field Level. Here Field Name will be taken automatically. Now select Field Type. Here are a lot of options. You can set Text/Number/Email/Message/Checkbox and some other options. So choose what you want to add as custom field. Here I’ve selected Text as my Brand name is a text. The good news is you can add Custom field anywhere like post/page/template. To select the functionality go to Location. I want to add custom field as post in our product. So I’ve selected Post Type in “Show this field group if”. Also select the field “is equal to product” to Product. Now click on Publish button from the top of the page. So I’ve created an Advanced Custom Field option for Product. Before I’ve said that custom fields can be added anywhere. In this guide I’ve used this custom field in a WooCommerce Product Table. If you want to know about the plugin have a look into my previous post about Woo Product Table Pro. Before showing a custom fields in Product Table let’s look how is the table. There I want to add an extra column for Brand. I mean, I’ll add a column that will show products of different brand. How to show Custom Fields? In three steps you can show the created Custom Fields In WooComerce Product Table. Click on the products to edit. Just up to the bottom of screen there you will get a Brand Name option. Select your brand name in text-box named Value. I put here Polo for for a Tshirt. Finally Publish the product page. Now go to shortcode generator of Woo Product Table pro (Dashboard->Product Table->Product Table) and generate shortcode. Copy the shortcode and paste in which page/post you want to show the custom fields. You can follow my previous post WooCommerce Product Table : Boost Your Sale to know in details to know about configuring shortcode. Here I’ve given brand as I selected Field Name to brand before. Note: Always select small letter for this sector. So here an extra column has appeared than before named Brand. Though using Custom Fields In WooComerce is a tedious task to do for a beginner, anyone can do it following the above steps. I hope you’ve gotten it using Custom Field. If you have more specific question, please leave a comment below. You won’t believe how dramatically your sale will increase, if you don’t use WooCommerce Product Table in your WooCommerce store to show your products. All of our clients have highly praised for this plugin for its usability and features. Their sell have increased after using Woo Product Table. Using Woo Product Table Pro Plugin you’ll be able to show your WooCommerce products in a shortable table view. You can display your products in the table by Category, Tag, Price etc also you can Search or Filter your WooCommerce products by Custom Fields or Taxonomy. 11 notable awesome feature that your WooCommerce site should have to increase conversion rate and Boost Sell. 11 feature of this plugin, that you need to customize your product table easily and display the products exactly how your customer want to see. When should I use WooCommerce Product Table? Today I’m going to show how to create a WooCommerce Product Table using Woo Product Table Pro as well as explains how to increase your sale. In three steps I’m going to show you how to create this amazing Product Table. The main advantage of this plugin for beginner is you need not ABC of coding. 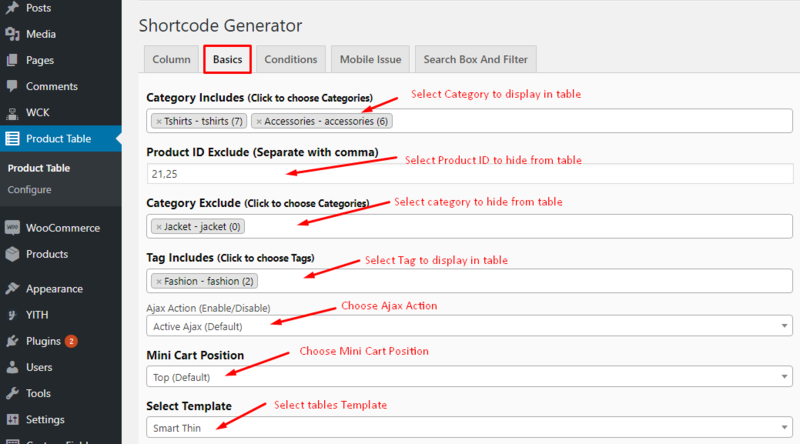 Just select the options you want to show in your product table and generate shortcode. Copy the shortcode and paste to a page or post. Isn’t that very simple? As a WooCommerce add-ons plugin first be sure to install and activate WooCommerce on your site. Then install Woo Product Table pro plugin and from Dashboard’s plugin section activate it. After activating the plugin navigate to Dashboard>Product Table>Product Table. 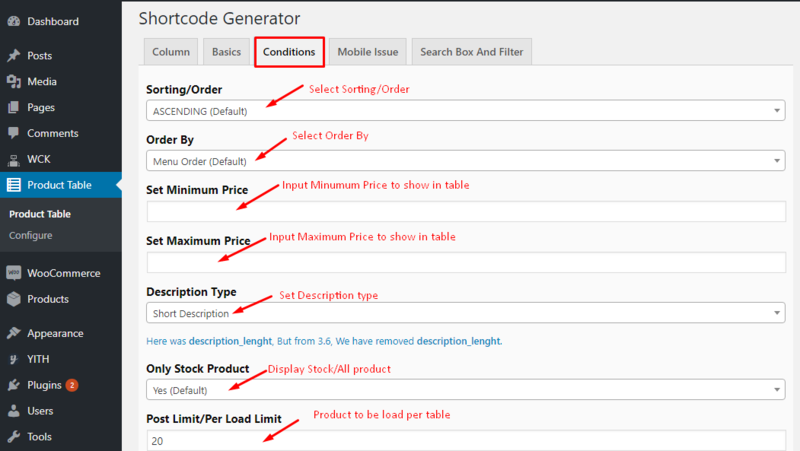 Here you will see a Shortcode Generator panel to configure your desired table. There are five different tabs to customize your table. I’m describing in short about those tabs. In the column tab chose your preferred table header what you are going to show your visitors also you can rename your table header upon your language. There are several rows, each of them consists of three different columns in the Column tab. The first one is Drag and Drop option to arrange the table’s header column. The second one is several Input Text Field Option to Set/Rename the tables header name. From the last column tick the Checkbox to include the item in the table. To select a Column including in your table just tick the Checkbox. For example, if you want to show Thumbnails and Product Title in your Product Table just tick the respected checkbox as I’ve shown below screenshot. You can also customize the table header. To do it, click on the input text field. There are some table header set as default. Click on which you want to customize/rename. Suppose you want to change Category and set as Class. Then click on the field named Category and rename it as Class. Now go to Basics tab. There are lot of options to configure your Product Table. If you want to include a category or some categories in your table click on the box named Category Includes. Then select those categories which you want to include in your table. Similarly you can select the category to exclude from the table by selecting it from Category Exclude. If you want to hide a product from Product Table input the product id in Product ID Exclude. Separate with comma (,) if have more than one. Ajax action is set as default in Woo Product Table pro. When enable, your products will be added in a Mini-Cart above the table and it needs no page reload. However you can change it if you want to redirect to product page when user click on Add to Cart button from the table . When a customer buy a product it is dropped in a Mini-Cart that is shown above your Product Table. You can set it below the table or hide it from Mini Cart Position . Bored of default Tables Template? Change it from Select template option. In Woo Product Table pro there are different six template. Select anyone from them. If nothing is select default template will be applicable. There are also many more customization in Basics Tab to Edit/Rename the default text. You can check it yourself. In conditions tab you may set conditions how product will be shown in table. To select sorting/order click the box named Sorting/Order and choose it Ascending/Descending or Random. Set the minimum price from Set Minimum Price box and set maximum price from Set Maximum Price box. If you want to set the products description length, set it from Description Type box. In Woo Product Table Pro only stock product is set as default. So only stock product will be shown in table. But if you want to show all product in Product Table just select All Product from Only Stock Product text-box. You can choose how may product to be shown in product table. Just input the number in Post Limit/Per Load Limit option. If you have more product than you input in Post Limit option, don’t worry. There is a load more button to load more product. WPT pro is set as default Responsive. However, if you want to change responsiveness navigate to Mobile Issues tab and choose No-Responsive from Mobile Responsive option. You may also hide some info in mobile device. To do it check the checkbox like the picture shown below. If you want a Advanced Search option above your table it is set as default. To remove the feature just go to Search Box And Filter tab and choose “No Search Box” from Advance Search Box. After all is setup click on Generate Shortcode, copy that from text-box and paste in your desired page/post. You’ll find shortcode generator below all five tabs that I described above. Now publish the page/post. You’re Done. There are 6 predefined Table Template. You can set your each table differently. So choose your best one among the given 6 template. The Smart Thin Template with advance search box and filter. Your product table looks dynamic in Blue Template. Blacky Template is smart choice of tables template. Green Template is a amazing template that catches attraction of user. If you doesn’t select any template for your table then default template will be applicable. Template None is the table where there is no styling from WooCommerce Product Table Plugin. As a result the styling of this table get from the theme activated in your WordPress site. There is a good news for you that you can use Custom Field in Woo Product Table Pro. To use custom fields in your product table install and active Advanced Custom Fields. How To Add Custom Fields In WooComerce Product Table. Suppose you want to display extra information about the product in the table then you can use Custom Post Types and Custom Fields creator – WCK. In the screenshot below I’ve created a custom taxonomy named color to display the color of the product. You create your desired ones upon your demand. Please follow How to use Custom Taxonomy in WooCommerce to know more about creating and customizing Custom Taxonomy. This plugin is also compatible with YITH WooCommerce Wishlist. So you can make a wish list for your desired product. In the same time you can request a quote for your selected product. That means you can add extra message after browsing to the Quote List page. Woo Product Table Pro allows Advanced Search. For this customer can search any products within your website. Also they can search products through custom taxonomy. Advance Search option help potential user to find desired product in a short time. For this they will use your site very frequent. As a result sell increases. Suppose you have loaded a table of about 250 products. Potential customer may be bored of finding their desired product. What if there is a filter option to filter from those product. Yes Woo Product Table Pro have the feature to filter among the loaded products by Product Title/Category/Tag. See Search Product in Product Table to know in details about how search option works in WooCommerce Product Table plugin. Sometimes customer may wants to see products by specific Category/Tag/any Custom Taxonomy. This specially works when you run a wholesale store or customer wants to buy a specific types of product. So in the shown picture above you can filter your product by Category/Tag/Color/Size. If you want to know more details about Filter see WooCommerce Filter for Product Table: Adding and Customizing. Therefore, by WooCommerce Product Table plugin customer finds their products easily in a short time. Also you can show your product information more dynamically. Besides, this plugin take less time to load page than any other WooCommerce Product Table plugin. So customer doesn’t get bored of page loading. They visit frequently whenever they need to purchase. As a result sell increases.